International yoga and meditation instructor, wellness philanthropist, movement motivator, healing guide, music head, and Spiritually Fly theorist. Faith Hunter began her practice of yoga and meditation in the early 90s as a way to cope while her beloved brother Michael was dying from complications related to AIDS. Through mindfulness and personal reflection, Faith was able to release her fears and experience an awakening from within. From that day forward, she committed herself to sharing these practices with the world. Always eager to learn, explore, and share, Faith has been teaching since 2003 and is an inspiring and generous mentor to wellness practitioners of all skill levels. 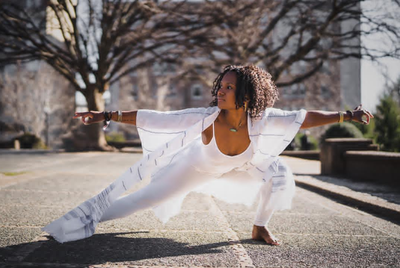 With a BS degree in Marketing from Grambling State University and an MBA from Loyola University, Faith is the Owner and Creator of Embrace Yoga DC, a yoga and wellness center located in Adams Morgan – a multicultural nest of Washington, DC. She is also the architect of Spiritually Fly™, a life philosophy that celebrates every moment of life, and uses the technology of breath, movement, sound (chanting & music), and stillness, in a fresh and modern way to encourage students to live an epic life. Her passionate teaching style is heavily influenced by Kundalini Yoga, Vinyasa, and various forms of meditation. A next-generation teacher Faith blends Classic yogic principles and real-world occurrences into an integrated experience that is grounded, radical and unforgettably Spiritually Fly™. As a creative spirit, Faith is also a writer who has merged her love of poetry and meditation into numerous projects. Her latest is Shades of the Soul: A Meditation Journal (releasing April 2018), that blends her original poems and daily inspirational thoughts. A favorite choice for mass yoga gatherings Faith has taught at yoga at the great lawn, the Cherry Blossom Festival in Washington DC, multiple Wanderlust 108 events (US and Mexico), The White House Easter Egg Roll and is an esteemed faculty member for Kripalu and Yogaville. She tours internationally teaching yoga and meditation workshops, teacher trainings, and an assortment of public appearances. Faith is also a media darling having graced the covers of Yoga Journal (twice), Om Yoga & Lifestyle (UK based), Origin Magazine, and Sweat Equity. 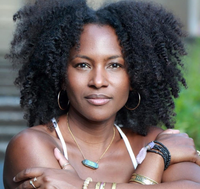 She has also appeared in Essence, Black Enterprise, Washington Post, Women’s Health, Shape Magazine, and several publications and numerous blogs. Faith is a Yoga Expert for BeachBody, where she’s one of the key instructors for 3-week Yoga Retreat.